Jaipur; Sept 24, 2018: USA-based Theoretical Quantum physicist, Dr. Amit Goswami, Founder, Quantum Activism Movement worldwide, who is best known for his research on Quantum Activism and conscience, has found a team of supporters in India, which will together take his concept and work forward. IITian Mr. Anil Sinha, Director Research and Education, who is credited with co-founding “Consciousness Engineering Research Foundation” at Pyramid Valley, Bangalore which has established a Meditation Lab and a global conference on Quantum Energy Medicine is part of the team. Dr. Valentina Onisor, Integrative Medicine and transformational expert who travels with Dr. Goswami for Quantum workshops is also in the foundation team. Mr. Dinesh Kukreja, CEO, Quantum Activism Village Foundation, a businessman from Jaipur, himself a professed quantum activism enthusiast has joined force with Prof. Sinha and set up a company by the name of Quantum Activism Village Foundation to realize dream of establishing a 300-acre village on the ‘quantum’ concepts. 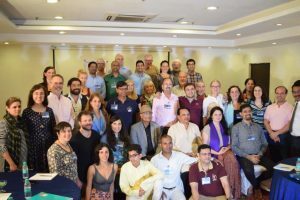 As a prelude to the main project of establishing Quantum Vishwalayam, the foundation has come up with its inaugural course as a One-Year Certification Program in Quantum Science and Conscious Leadership in New Delhi last month. This course will have two semesters, first would concentrate on self-development and the latter would focus on professional development and integration. The educational program aims to inculcate a holistic and transformational system based on the fundamentals of ancient wisdom with the backing of authentic scientific research on quantum science and consciousness. This one-year program will comprise of 20-days of intense classroom teaching sessions and the rest of the curriculum would be given through internet. The objective is to assimilate the practice of right thinking and right living in congruence with the means of earning livelihood by integrating science of consciousness into our lives. The first batch of 40 students from 12 countries has started the course program last month. The objective is to assimilate the practice of right thinking and right living in congruence with the means of earning livelihood by integrating science of consciousness into our lives. The course will have a combination of proximity and distance teaching modules. He emphasized the importance of India as a cradle of spirituality where a very advanced civilization and system of knowledge had developed ages ago and how his research in Quantum sciences has shown that the “consciousness is the ground of all being”- a truth recognized by our ancient wisdom that created institutions of higher learning e.g. Taxila and Nalanda. He averred that a revival of this ancient knowledge based on the paradigm of modern science provides us with viable and sustainable models for achieving global peace, prosperity and happiness for all.